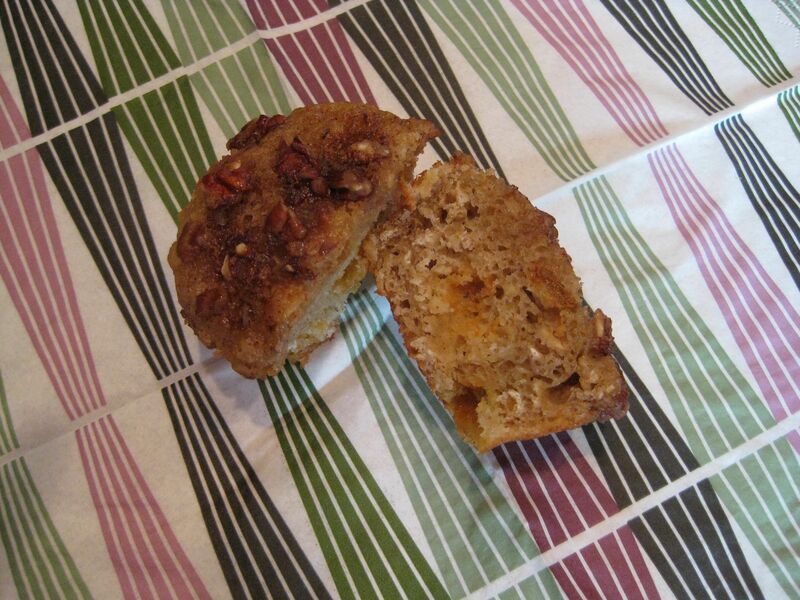 This week’s recipe for the Tuesdays with Dorie bakers is Oatmeal Breakfast Bread. From the title, I thought it would be a yeast bread, but actually it’s a quick bread, and I decided to bake it as muffins. Lightly spiced with cinnamon and nutmeg and topped with brown sugar, cinnamon, and nuts, this is a delicious breakfast treat. Natalie from Oven Love selected this wonderful recipe. Thanks Natalie! This recipe contains applesauce and oil but no butter, making it lower in fat than many of Dorie’s recipes. In the book, she mentions that there was a trend in the 1980s to lower fat in recipes by using applesauce and prune puree. Does anyone remember the prune puree you could buy in the store? I remember buying it thought I don’t remember what I baked with it. Probably muffins! Made a full batch and baked it as 12 (pretty full) muffins. Replaced about half of the oil with plain yogurt. Omitted the pinch of ground cloves. Scooped six muffins into the pan, then stirred golden raisins into the remaining half of the batter (known as the better half). I have pecans in the freezer, so that was the nut of choice for the topping. How it went: So easy. I love making quick breads! How it tasted: So, so good. I have had great success with Dorie’s muffins and quick breads, and this was another big hit with me. I loved that it wasn’t so sinful, but was still delicious. I loved how delicious the topping was, even though it was only brown sugar, cinnamon, and nuts. My husband enjoyed his raisin-free muffins and when I asked him for a review, he said the topping was his favorite part. Who knew that topping without butter would a) stick to the muffin and b) taste good? Take a look on page 44 of Baking: From My Home to Yours, or the recipe will be published on Oven Love today. Nice muffins. I would have totally made muffins, too, instead of loaves, but decided this really was coffee cake. So coffee cake it was! And I went with two version. Great idea to sub the yogurt! the topping was the star of the show, to me at least. it gave it that extra punch into sinful-ville. your muffins look fab! I think these needed a little chocolate! LOL – I am not sure we went through a prune puree period here. Your muffins look fab, and glad your hubby liked them too. Prune puree? I remember prune juice which was not nice. But I love stewed prunes. This dessert, though, is a winner. Whole oats, as good for the digestion as prunes. thanks so much for baking with me! glad you enjoyed it. Love it. Very delicous breakfast treat for sure! The muffin looks great! Seriously, I am so impressed with how delicious a streusel topping without butter can be. I had to add coconut to (the better) half of the TWD carrot cookies two weeks ago – picky men! I am a huge oatmeal lover and your muffins look delicious, and perfect for snacking. Muffins…just need to go there with those soon. I love the idea of the yogurt in this as well. Everything looks great! oh! you subbed yogurt for some of the oil–brilliant! and i loved that you baked these into muffins. i’ll have to try that next time…and there WILL be a next time. these were delicious! Nice move, putting some yogurt in there, too. Gotta love a simple and delicious recipe like this one! I was totally surprised that the butter free topping tasted so great! These look delicious! Muffins would be good on so many levels…maybe it would have solved my moist middle problem. Based on so many favorable reactions to this one, I’m going to have to try it again. Looks great! I’m looking forward to making those muffins, too.